Many of you will be staying in, doing your own thing, possibly binging your latest love on Netflix. But for many of you, especially here on the Hill, your first love happens to be politics and today’s speech may be a doozy (or it may not): It’s State of the Union address night! Del. Eleanor Holmes Norton has invited Faye Smith to be her guest at the SOTU tonight. Ms. Smith is a DC resident and a federally-contracted Smithsonian security officer, as well as a mother and grandmother who faced near eviction during the Federal shutdown. Mayor Muriel Bowser will be attending the SOTU as a guest of Speaker Nancy Pelosi. The President will be arriving at the Capitol by 8:40 p.m. and the speech will formally begin at 9:10 p.m. It is expected to last about an hour. 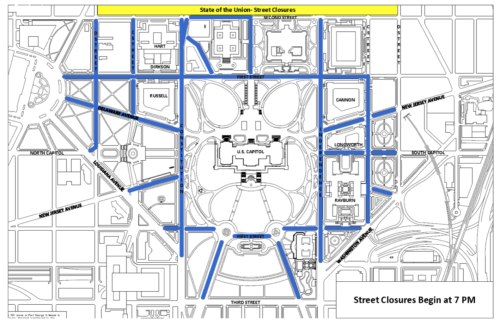 Road closures. See larger map over at WTOP. Looks like the Hawk ‘n’ Dove, 329 Pennsylvania Ave., SE, might be THE place to go, as there will be a SOTU Response party to cheer Stacy Abrams, the first African American woman to deliver the response. They will also have Flip Night, where the law of averages decides whether the bar pays for your drink or not. Wisdom, 1432 Pennsylvania Avenue SE, will have the Donnie Wallbanger for $6.Galliano, Vodka and orange juice have never had a better name. At Mission Navy Yard, 1221 Van St., SE, you can watch the speech with DC Young Republicans and Arlington Falls Church Young Republicans, while you enjoy drink and nacho specials as well as bask in a little bit of situational irony. Union Pub, 201 Massachusetts Avenue SE, will have colorfully-named drinks on special: “This Drink Isn’t Fake It’s Good Genes,” and “Who’s Gonna Pay for It?–Mexico,” plus a selection of cheap beer and rail drink specials. You can also watch the speech from Duffy’s, 1016 H St NE, where they will be playing SOTU Bingo. At FinnMcCool’s, 713 8th Street SE, the deal cannot get better than this: Ladies’ Night. From 8 to 10 p.m. LADIES DRINK FREE!!!! NO BS!!!! FREE FREE FREE! Honestly, we’re all going to need it. Speaking of SOTU bingo, there are some nice ones out there, from the educational to the angry feminist. Whether you’re watching at home or drinking with friends at a bar, why not print a few cards up and play along? Finally, a DIY bingo from the Washington Post. Bonus points for creativity!